NOTE: These shirts run about a size smaller than you are used to! If you normally wear a large this will be a tighter fitting large. so if you like the shirt loose then order one size larger than normal. 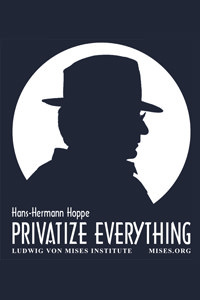 Hans-Hermann Hoppe is one of the giants of liberty in our time. He has contributed to economic theory (firming up property rights theory), ethics (providing an epistemological foundation for individualism), philosophy (deductivism has never been so compelling), and politics (democracy is the god that failed). In honor of the festschrift published on his 60th year (Property, Freedom, and Society) Here is the accompanying tee shirt that captures the man and his spirit. 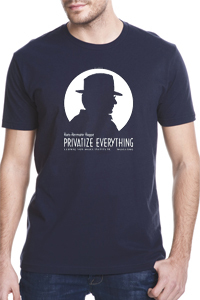 And the slogan underneath: Privatize Everything.